A list of US Battleships to help model boat builders find model plans and kits of US coastal, pre-dreadnought, WW1 and WW2 battleships. US Battleships are easier to keep track of than those from any other nation because of their unique hull number. As a result, ships with the same name can easily be told apart. The US and its Navy was late to become a top-tier blue-water super power. War torn and scarred after the Civil War, the main focus was still on coastal and river monitors. As several South American nations started acquiring armored ships, the US found itself trailing behind. In 1883 the Brazilian Navy took delivery of the Battleship Riachuelo – a coastal pre-dreadnought of 5,029 tons and four nine-inch guns. All of a sudden Brazil had the most powerful navy in the Western Hemisphere. The US responded with the experimental coastal defense Battleships USS Maine and USS Texas. This is the same approach the Imperial German Navy had gone through about two decades earlier. 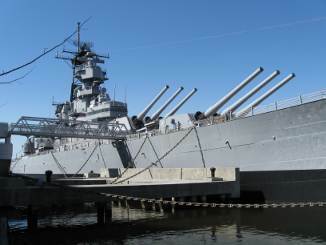 The list of US Battleships end with the USS Wisconsin (BB-64), the last commissioned US Battleship. For reference, and to avoid gaps and confusion, the list includes the names and hull numbers of canceled ships as well. The years listed refer to first year of commission.